Torque & Angle 25 ft/lbs. + 55 deg. Torque & Angle 30 ft/lbs. + 50 deg. Torque & Angle 20 ft/lbs. + 25 deg. Torque & Angle 30 ft/lbs. + 60 deg. Torque & Angle 20 ft/lbs. + 20 deg. Torque & Angle 25 ft/lbs. + 50 deg. You’ve spent a lot of time and money building an engine… don’t risk damage by failing to tighten the rod bolts correctly. 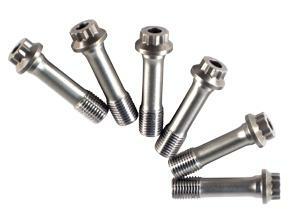 It’s important to note that a fastener is like a very stiff spring and it must be stretched a specific amount. The material’s ability to “rebound” like a spring is what provides the clamping force to keep the rod bolted together. If you do not stretch the bolt enough there may not be enough clamp load to keep the rod cap in place, which could result in broken bolts or spun bearings. If you stretch the bolt too much, you can exceed the yield strength of the fastener which will weaken it and cause it to fail. Either of these two conditions can result in catastrophic damage to your engine. Always follow the manufacturer’s instructions to prevent damage to your engine.